There are newer versions of this map available. To see them, view all Afghanistan updates. Welcome to PolGeoNow's brand new series of Afghanistan control maps! In the coming months, we'll publish more maps spanning the gap between 2014 and 2018, leading into routine updates of the current situation. To secure your access to all future installments, sign up now for our professional conflict map subscription service! This map has been slightly revised. You can see the original here. Contact us for permission to use this map. Afghanistan: Who Controlled What in 2014? The date is April 5, 2014. It's been more than 12 years since a US-led invasion helped overthrow the Taliban's Islamic Emirate of Afghanistan, a religious hardline government that ruled most of the mountainous country from 1996 to 2001. Its successor, the NATO-backed Islamic Republic of Afghanistan, is voting today on a replacement for President Hamid Karzai, who has led the country ever since the Taliban government's fall in 2001. Though the Taliban lost all their territory in 2001, the group was soon reborn as an insurgency, waging guerilla war on the Karzai government and its foreign allies. By 2005, the Taliban forces had started retaking control of some areas, and they continued until a 2009 surge in US troop reinforcements turned the tables and began reversing their gains. Now, in early 2014, the Taliban are near their lowest point of territorial control in five years - a UN fact-finding mission reports that the group and its allies control only four of Afghanistan's 373 districts. Still, the report acknowledges that 41% of the country's districts are exposed enough to Taliban influence for their administrations to be facing "raised" or "high" threat levels at the time of the election. The US and its international allies have been decreasing their number of troops in Afghanistan since 2011, with plans to mostly withdraw by the end of this year. While some analysts are optimistic that the Afghan security forces can hold off the Taliban on their own, others speculate that there will be a shift back towards Taliban control in the coming years. 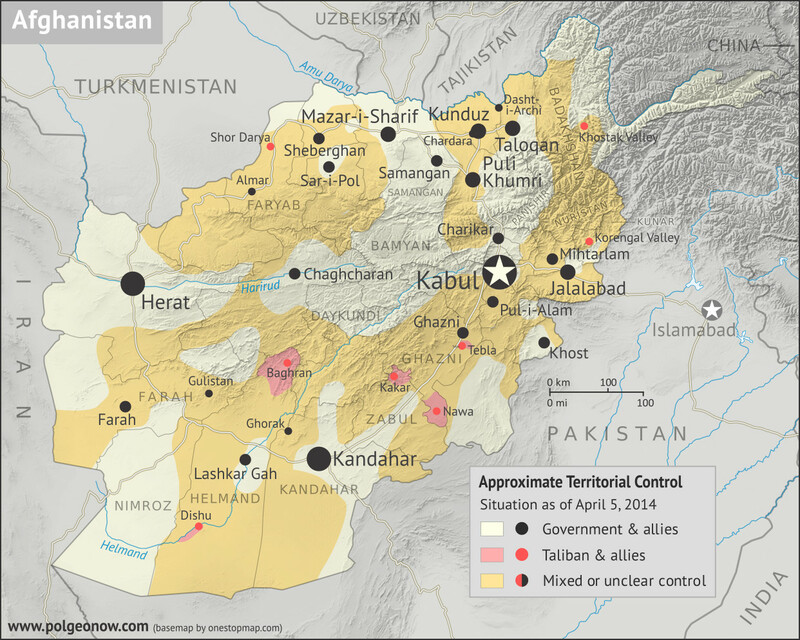 To find out what happens next, stay tuned for our 2015 Afghanistan control map, coming soon! The four districts reported to be under Taliban or allied control in April 2014 are Dishu and Baghran in Helmand province, Kakar (Khak-e-Afghan) in Zabul province, and Nawa in Ghazni province. But this only counts districts whose capitals have been fully captured by the rebels, and it's no secret that Taliban forces have free reign over many other areas of the countryside outside district centers. In fact, 10% of the country's polling centers don't even plan to open for the April 5 election, either because the Taliban can too easily disrupt voting there, or because their locations are entirely behind enemy lines. Much of Afghanistan's mountains and countryside are a patchwork of Taliban-aligned and pro-government control, or see situations of mixed control, with Taliban and government structures existing side-by-side and jockeying for political and military dominance. Meanwhile, the status of many areas is simply unknown, with at least some of them likely under full Taliban control. Districts known to be majority Taliban-administered outside of their centers at this time include Gulistan in Farah province, Chardara (Chahar Dara) and Dasht-i-Archi districts in Kunduz province, Ghorak in Kandahar province, and Almar in Faryab province. Large swaths of Nuristan province are also likely controlled by the Taliban. Some specific locations reported to be under firm Taliban control include Tebla and nearby villages in Ghazni; Shor Darya, Turbat, and Khwaja Kinti in Faryab; the Korengal Valley in Kunar; the Khostak Valley in Badakhshan; and the Mahmand Valley south of Jalalabad. Afghanistan's major population centers are all government-held, with capital city Kabul especially well-fortified, though none are immune to occasional attacks by Taliban operatives. And though the conflict sometimes seems to engulf the whole country, the provinces of Panjshir, Bamyan, Daykundi, Samangan, and Nimroz stand out as being mostly free of Taliban influence. More Afghanistan control maps coming soon, with present-day coverage beginning in 2019! To secure access to all updates, sign up for our professional conflict map subscription service! Check for updates to the map and timeline by viewing all Afghanistan articles on PolGeoNow! 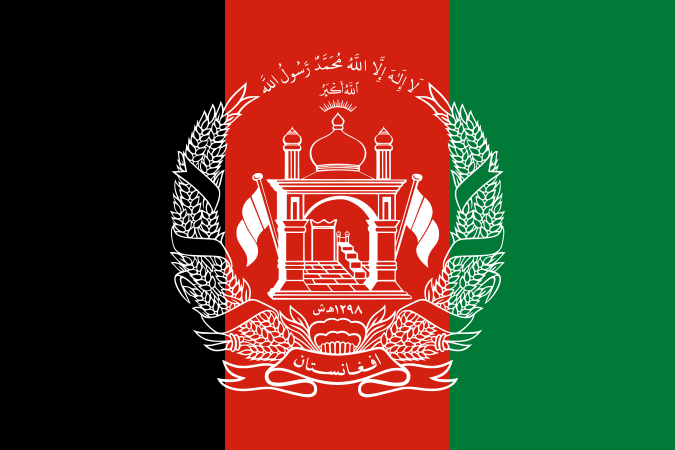 Graphic of the Afghan flag used under CC BY-SA license (source).